Sheba’s has been proudly serving the dog community since 2004 and our goal has never changed; offer a quality service at an affordable price and treat every camper like family. Our facility is located on a 10-acre farm in beautiful York, SC. 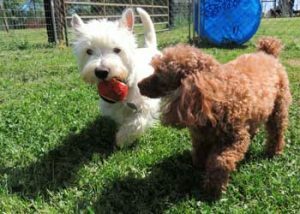 Completely fenced and set back from the main road, it is the ideal rural setting for dogs to enjoy off leash fun. We offer dog day care, boarding and grooming all with a convenient shuttle service option. Our shuttle service includes the areas of York, Rock Hill, Fort Mill, Tega Cay, Lake Wylie, South Carolina and the Ballantyne area in North Carolina. Even better is that you don’t have to be home to receive us. In fact the majority of our clients take advantage of this convenient service and love it. They also have peace of mind knowing that we are bonded and insured with years of experience and have trainer, veterinarian and industry professional references; which are always available upon request. People have often asked me or wondered why I named the business Sheba’s. Well, the name actually came from a lovable Lab mix that I adopted many years ago and decided to name Sheba. One morning I stopped by a local pet store to see the pups they had available for adoption and there she was. An adorable black and tan pup that made her way through her littermates to lick my hand and say hello. Was it love at first sight? Yep! So I filled out the adoption paperwork, bought puppy food and all the cute things puppies need – leash, bowl, collar, toys and off we went to her new home. 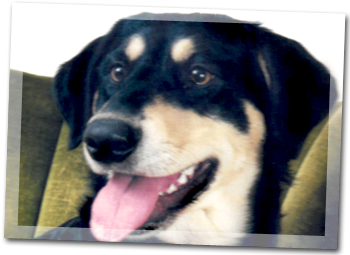 It is easy to say that Sheba was one of the best dogs I’ve ever had the pleasure to share my life with. She was a big, gentle being. She would always greet everyone with her head slightly lowered and showing her teeth. A behavior that can be quite unnerving coming from a 70 pound dog that looks a lot like a Rottweiler but I would assure them that it was her way of smiling. I even read somewhere that only a small percentage of dogs greet you with teeth exposed and lips back – so indeed Sheba was quite special. She graced our lives for almost ten years. Along the way, I adopted more pups and Sheba always happily welcomed them into the family. With all the names I could have chosen for my business, Sheba still seems like the most fitting. She represented what everyone hopes their dogs will be – well behaved, loving, and greeting all they meet with a smile. So the next time you see the Sheba logo; know that it was designed by a very special friend – Mike Ferreira – who was not only instrumental in helping me start the business but also a talented artist and the logo is Sheba. 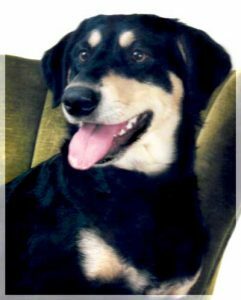 A black and tan dog that was loved and will live forever in our hearts.